If your child is being formula fed and has encountered specific feeding problems, we offer a range of scientifically-based specialty formulas. As with the introduction of any formula, these products should only be used in consultation with your healthcare professional. Aptamil Gold+ AllerPro Premium Starter Infant Formula is nutritionally complete for formula fed infants from birth to 6 months. Suitable for babies at high risk of allergy (parent or sibling diagnosed) or with confirmed mild to moderate cows' milk and/or soy protein allergy. To help reduce the allergic response of the immune system. For the management of confirmed mild to moderate cows' milk and/or soy protein allergy. Scientifically researched and shown to reduce allergy symptoms and help protect against allergy. 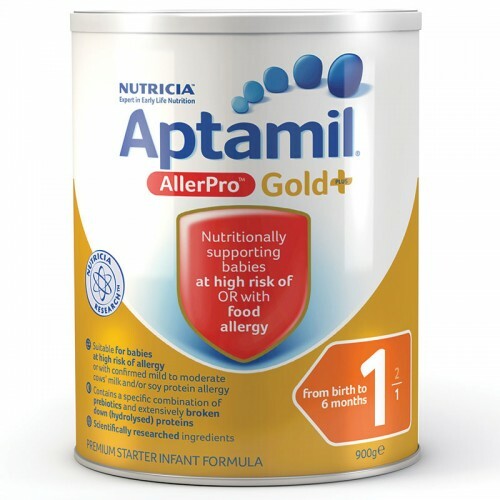 Aptamil Gold+ AllerPro Infant Formula is not suitable for general use and should be used under medical supervision. NOT to be used for infants with anaphylactic (severe) cows' milk and/or soy protein allergy. AllerPro is not suitable for general use and should be used under medical supervision to ensure adequate infant growth and development. Aptamil Gold+ Pepti JuniorFood allergy or malabsorption: 0-12 monthsAptamil Gold Pepti Junior ..